I hate lacking information when I fly, especially about delays. Sometimes, I'll rush to get to the airport on time, only to have a flight delayed at that point. Who cares if you can look up a flight status before getting in a taxi, if the plane gets officially delayed afterwards? 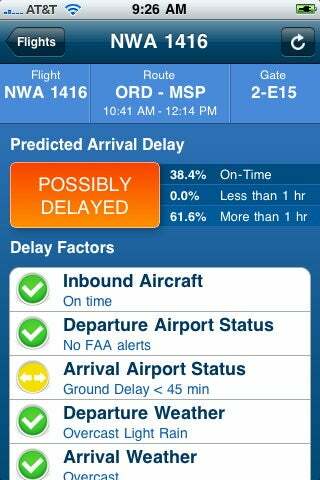 FlightCaster preempts this situation by predicting potential delays before the airline makes an announcement. The free website lets you look up U.S. domestic flights from yesterday, today, or tomorrow. In addition to tracking official delay information for the airline--and basics including the gate number--the site factors in many conditions to estimate your schedule. FlightCaster's prediction data-points seem as elegant as they could be effective. FlightCaster tracks your inbound aircraft; that arrival turns into your departure, so unless an airline scrambles an extra jet--which happens on occasion--you can't leave without that plane. FlightCaster considers current FAA alerts about weather and airport status in your departure and arrival cities. FlightCaster also weighs 10 years of flight data; delays are often predictable based on previous patterns. All combined, FlightCaster spits back its departure estimation. It even guesses the the length of the hold-up. You might even know that a flight will be delayed before the airline itself, saving you from wasting time at the gate. Because the service relies on previous FAA records, FlightCaster works only with U.S. domestic routes. A spokesperson said that the company plans to eventually add international flights with a U.S. origin or destination. Then, depending on the data available, FlightCaster might be updated for flights worldwide. Before expanding its service, FlightCaster will add push updates, such as email and SMS alerts. And if you're ever stuck and trying to get to a destination, an update might suggest alternate routes or airlines based on current predictions. More than an hour ahead of its departure today, I found that FlightCaster had predicted a delay on Northwest 1416 from Chicago O'Hare to Minneapolis. The service even estimated that the hold-up would last for more than an hour. Northwest waited until about 20 minutes ahead of the scheduled departure time to say it'd be just a few more minutes. After updating in that manner for 20 minutes, Northwest finally estimated--or admitted--an hour-long delay. I'm impressed, even though I've only briefly sampled the service so far. If FlightCaster nails other predictions as well as this one, it could be an invaluable travel tool.